If you have visited the Museum over the previous two weeks, you may well have noticed some unusual looking American vehicles discretely parked behind our main hangar. Certainly, visitors to our Vintage Props Day were very curious to find out exactly what these American trucks with German registration plates were doing with us, often seen departing from the Museum early each morning to the surrounding countryside and returning later in the day. Their plain navy blue appearance with no markings, the strange radar dishes and the variety of unusual accents from our mysterious guests all added to the intrigue, so we though you’d be interested to know more. American trucks and German registrations? What’s happening at the Museum? Our visitors were from an organisation called Polygone. They are a multi national organisation, comprising American, German and French Air Force people. Based in Germany, they deploy anywhere in the world to provide electronic warfare training for air combat pilots. The crew were based at Elvington to support training for the U.S. Air Force who were training overhead and way out into the North Sea military training zone. The Polygone crew’s role was to provide robust Electronic Warfare scenarios utilizing live and simulated surface to air threats for the US Air Force to train against. They were able to practice threat reactions to real-world integrated air defense systems (IADS) scenarios to help fast jet pilots sharpen their combat edge. At times, they would provide scenarios of defence missiles, whereby Elvington was an enemy airfield and the pilots could practice penetrating the defences. Other times, they provided simulated air to air threats, the computer systems trying to confuse and shoot down the USAF pilots. Their skill and expertise allows military pilots to train against a real, authentic threat, with the complex systems able to provide almost real time feedback to US Air Force instructors in the UK and Germany to help training. The equipment they brought with them comprised a ‘Godfather’ station which remained at the Museum for the duration, while the smaller mobile units deloyed to areas around Yorkshire each day depending upon what the US Air Force pilots needed to train against. They were spotted as far away as Bridlington and Scarborough on occasion. 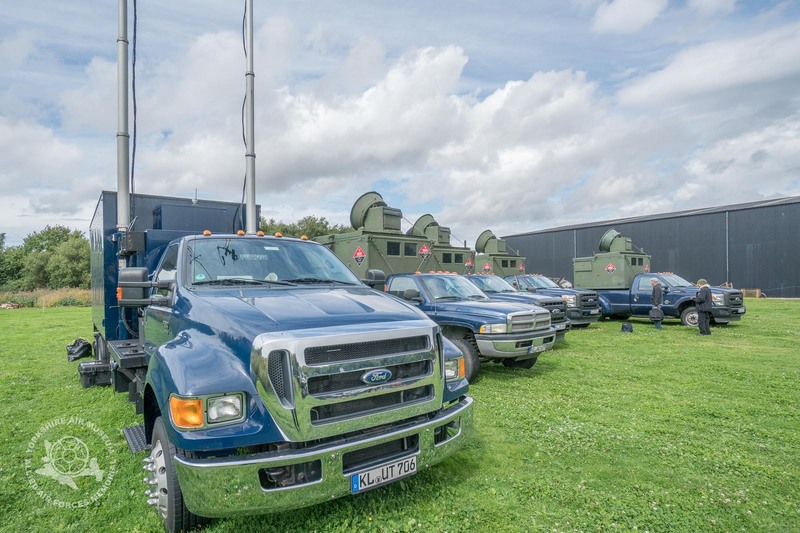 It was great to see first hand some of the cutting edge technology in these vehicles as the team has been deployed to almost every large military NATO exercise in recent times, ranging across Europe and beyond. Very often, they are situated in rather remote locations with little to occupy their down time between exercises, so Yorkshire was a great location for them. The Polygone staff all really enjoyed their time in Yorkshire. With accommodation within the city of York, they had a great time exploring the city as well as coming along in their own time to our Vintage Props day to see our live aircraft engine runs, the BBMF Lancaster flypast and talk to our visitors. The two weeks they were with us gave us just a tiny insight into the complex art of modern aerial warfare and we really hope they will return to us again some time soon to turn Elvington into a Russian air base once again. Some of the aircews that flew from RAF Elvington in wartime would have been staggered at the range and power of these systems. Next time, we just need to talk those USAF pilots into some low level fly bys too.